Concerned about global warming, students are pushing for change--in their dining halls. This article is adapted from Anna Lappé's forthcoming book Diet for a Hot Planet (Bloomsbury), to be published in March. It was a little after midnight, long after the official conference had ended and the 500-plus attendees of the 2007 Food and Society annual get-together had turned in for the night. Tim Galarneau of the California Student Sustainability Coalition; Anim Steel from the Food Project, a Boston-based food and farming nonprofit; David Schwartz from Brown University; and a few other young people were still talking. Hunched over a table in an empty meeting room at the Grand Traverse Resort in Traverse City, Michigan, the group had already been together for hours, continuing a conversation that had been going on for more than a year. What was keeping them up so late? They were comparing notes. Each was witnessing a burgeoning student movement on college campuses to bring sustainably and fairly raised food into dining halls. From coast to coast, a similar energy and enthusiasm seemed to be bubbling up. Galarneau was seeing it in the massive effort to transform university food across California’s esteemed public university system. Schwartz was seeing it back in Providence at Brown, where students were getting increasingly vocal about finding sustainable food. And Steel, a leader in the food-justice movement, had a frontline view from the Food Project’s youth-run farm in Boston. From their unique perspectives, both sensed that students were hankering to speak up more loudly for sustainable food; they just needed an effective way to do so. Out of this ongoing conversation, the group would launch the Real Food Challenge. The concept is simple, really. Students, some who pay as much as $100,000, or more, for four years at a private college, should have a say in what grub their schools serve–and that food should reflect shared values of fairness and sustainability. The Real Food Challenge provides an organizing tool to empower students to persuade their schools to make the move. Schools that join the challenge pledge to shift at least 20 percent of school food to “real food”–sustainably raised, grown with fairness, and from local and regional farms–by 2020. In addition to this concrete goal, the Challenge also offers schools and student organizers a support network, resources for finding sources of real food, organizer training and a “real food calculator.” The calculator provides campuses with a mechanism for quantifying real food, for determining the percentage of real food they currently serve and assessing improvement over time. The excitement about the Real Food Challenge, Galarneau said, is partly that it taps into students’ energy to address the global warming impact of their campuses. One strategy of student environmental activists has been to focus on persuading their schools to reduce their global warming impact through rethinking institutional energy use and turning to renewable-energy sources. One of the most successful campus-based efforts to date is the Campus Climate Challenge. The initiative has helped young people in colleges and high schools across the United States and Canada organize to campaign for–and win–100 percent clean-energy policies at their schools. The Campus Climate Challenge served as inspiration for the Real Food Challenge founders, who were interested in channeling student excitement in a new direction. “There was a lot of momentum around climate change on campuses. Al Gore had swept onto the scene,” said Galarneau. “But the activism lacked a connection with the food system.” And yet the global food system, from seed to plate to landfill, is responsible for as much as one-third of all greenhouse-gas emissions, largely because it is the single greatest force behind deforestation and soil degradation, both of which release carbon dioxide into the atmosphere. Indeed, livestock production alone is responsible for 18 percent of the world’s emissions, more than those produced by all transportation–every SUV, steamer ship and jet plane combined. “Many young people are realizing that the food system is a key contributor to global warming. They know that we’ve got to talk about food if we’re going to advance a broader sustainability agenda,” Galarneau noted. It would take another year and a half of conversations like the one back in that stuffy meeting room before the Real Food Challenge was officially launched in September 2008. But within a month, the original crew had hard proof that their hunch had been right. By the end of that first year, 329 campuses had joined the network, from Brown University to City College of New York to DeAnza Community College in San Mateo, California. The determined young people who lead the Challenge expect that in another year that number could grow to 1,000, about a quarter of all the two- and four-year colleges and universities in the country. To put the potential impact in context, US colleges and universities currently spend more than $4 billion annually on school food. (Roughly half of school food is contracted out to food-service companies; the rest is managed by the schools themselves.) If it’s successful, and the participating schools shift 20 percent of their purchases, the Real Food Challenge will have helped to move nearly $1 billion of food purchases toward sustainability by 2020. Connecting the overarching mission of the Real Food Challenge–increasing the amount of fairly and sustainably raised local foods on campuses–to the effort to combat climate change is a complex challenge. First and foremost, there’s the problem of quantifying the impact. Unlike getting data on campus energy use–emissions are relatively easy to measure and are usually the direct result of action (or inaction)–getting data on food is difficult. Campuses rarely know the full life story of the food they purchase. In part that’s because food-related emissions mostly occur during production, processing and distribution–long before the food shows up in the cafeteria. Plus, even for the “direct” emissions–energy used in dining halls, food waste ending up in landfills–schools often don’t have systems in place yet for accurate measurement. But a data gap doesn’t have to mean an action gap. The Real Food Challenge stresses that there are guiding principles for planet-friendly choices schools can make, including cutting back on meat and dairy, reducing waste and packaging, and choosing more sustainably raised and local foods, for instance. It was not long before the Real Food Challenge piqued the interest of food-service companies. In that initial launch month, said Galarneau, they were contacted by Aramark, Sodexo and Bon Appétit–some of the biggest players in college food service. “They were calling to say they wanted to partner with the Challenge,” he said. But Galarneau and the other organizers were wary of official corporate partnerships, concerned that companies would just be latching on to the initiative without actually changing their practices. They’d already seen food-service companies pay lip service to sustainability in their contracts without embracing broad change in the dining halls. As we talked, Galarneau described a 135-page food-service contract he was reviewing, hunting for language that would provide the company loopholes to skirt sustainability. “The devil is in the details,” he said. The Challenge, while popular among students on participating campuses, still faces many hurdles, including getting the ear of administrators facing one of the worst economic downturns in generations. But as the organizers like to point out, many of the climate-friendly principles actually help schools save money. Students at Stanford, for example, borrowed the Love Food, Hate Waste campaign from the United Kingdom to develop a way for people on campus to compost their waste easily. Erin Gaines, former sustainable-foods coordinator at Stanford Dining and Hospitality, and an active member of the Real Food Challenge, told me about their success. In 2007, thanks to the campaign, the school composted 1.2 million pounds of food from campus dining halls and cafes. That’s 1.2 million pounds that would have gone into a landfill. Instead, the scraps were taken to a local composting facility, and half of the compost was returned to the school to be used on its gardens and grounds. Galarneau offered an example from the University of California system. In response to student campaigning, the Santa Cruz campus decided to go “trayless” to address the pile-on phenomenon: students grabbing more food than their stomachs can hold. No trays means less washing. The school has already calculated a savings of more than 1 million gallons of water a year. And no trays means less food waste. Since the policy was introduced, the campus has seen food waste decline by one-third, and it is committed to diverting the remaining waste to compost. “The mantra is ‘upcycling,'” said Galarneau, “reducing waste before it becomes waste and then reintegrating waste, through composting, so that it never becomes waste.” This one step has helped reduce energy consumption (less dishwater to heat) and emissions (all that food kept out of landfills), saving the school money, which in turn leaves more resources to invest in sustainable food choices. This determination is making an impact well beyond the campus. Alumni of the Real Food Challenge are heading into communities where they’re using their passion and organizing skills to expand the market for real food across the country. 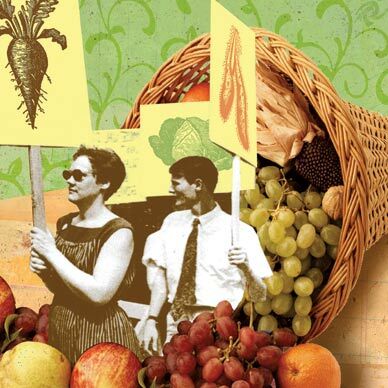 When I asked Galarneau and Steel for examples, they rattled off a bunch: Sue DeBlieck from Iowa State University is running a farm-to-school project in Maine; Sam Lipschultz, a 2009 Sarah Lawrence graduate, is starting a youth-run farmers’ market in one of Brooklyn’s poorest neighborhoods; and UC Irvine’s Hai Vo, who had been consulting with other youth-empowerment projects after college, just sent in his applications for programs in farm apprenticeship.